German Mutton Merino are well suited for intense production inrnarid or in agricultural areas. They are highly resistant and easily adapts tornany climate and keeping conditions. They grow easily with a good meat yield.rnNon- seasonal breeding cycle (3 breedings in 2 years), high fecundity, and goodrnmothering instincts make the Merinofleischschaf a good choice for intensernmilk-lamb production. rnrnrnrnThere are three German Merino breeds: Merinolandschaf (Merinornlandsheep), Merinofleischschaf (Merino mutton sheep), and Merinolangwollschafrn(Merino longwool sheep). 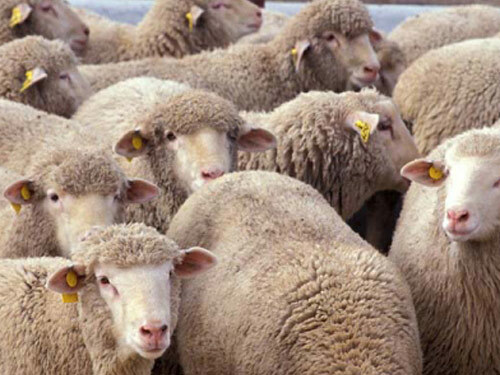 Although all three breeds produce Merino wool and arernsimilar in meat yield, they went through a different historical andrngenealogical development. The Merinofleischschaf is at home east of the Elbernriver, spreading all the way to the Ural Mountains.